This post contains spoilers for the ending of The Little Stranger. 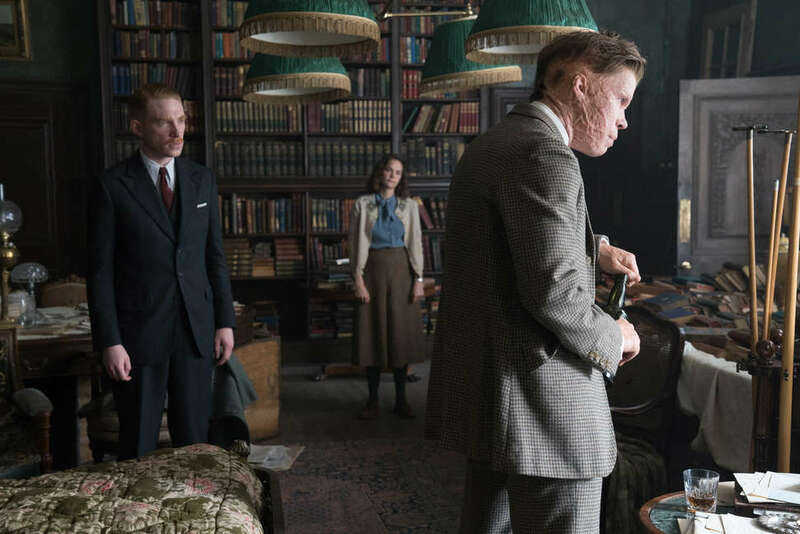 While there's a ghostly element that pervades director Lenny Abrahamson's adaptation of Sarah Waters' novel, The Little Stranger, it's not explicitly a horror film. (Despite what advertisements may lead you to believe.) Instead, it's a meditation on Britain's class system that leaves you guessing as to who is perpetrating the evils that befall the film's characters. Our unnerving guide through this world is Faraday (Domhnall Gleeson), a doctor who makes a house call to the dilapidated mansion, Hundreds Hall, in which the remaining members of the Ayres family reside. When he was a poor, local child, Faraday visited this once-great home, and ever since then, he has been entranced by it. As Faraday grows closer to the Hundreds residents, their fates grow more grim. Rod (Will Poulter) -- a former RAF pilot suffering from PTSD and debilitating injuries -- is sent to a mental hospital. Mrs. Ayres (Charlotte Rampling), the matriarch, is plagued by occurrences that lead her to believe her dead child is present. She eventually slits her wrists. 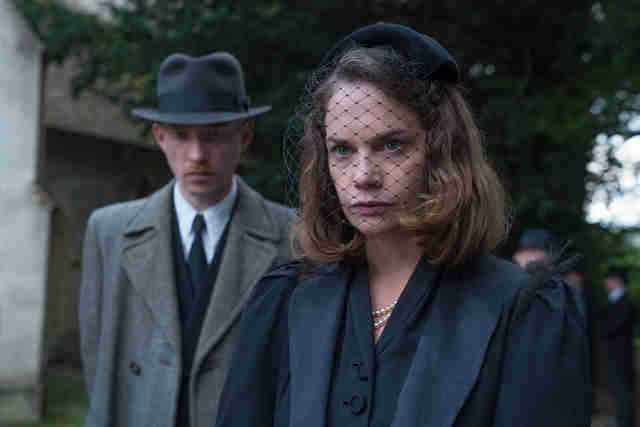 And finally Caroline (Ruth Wilson) -- to whom Faraday proposes marriage before she breaks off their relationship -- mysteriously plummets to her death one night in an act that may be suicide. Or something else. 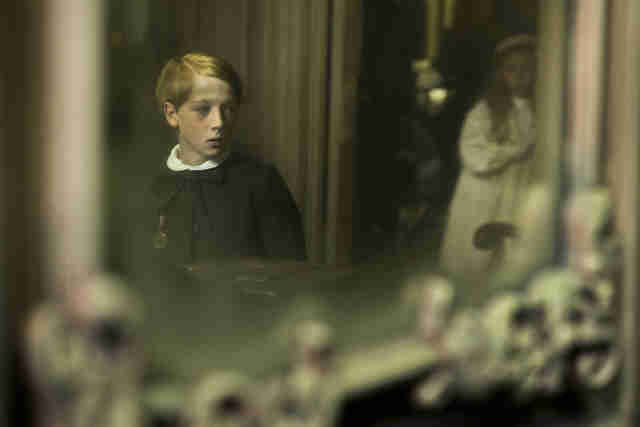 The final shot of the movie offers as explicit an explanation as it's going to give you: the spectral image of Faraday as a child peering down to where Caroline fell. Thrillist sat down with Abrahamson to unpack that eerie moment. Thrillist: The Little Stranger seems like an extremely challenging book to adapt. What made you want to tackle it? Lenny Abrahamson: I hadn't wanted to do another adaptation straight after [Emma Donoghue's] Room, but I had read [The Little Stranger novel] before Room and it just stayed with me. It just felt like I just couldn't let it go. So I went, "What the hell. Something is pushing me to do it." From the point of view of the craft of it, I really like for there to be something hard in a project, something that is challenging, which is going to stretch me as a filmmaker. In this case, you have such an interesting mixture of generic elements, but in the service of something very non-generic. When you say "generic," do you mean the ghost story? Abrahamson: Genre. Exactly. The ghost story. It seems like you could completely lean into the ghost story elements or you could do what you did, which is a little more in between. Abrahamson: It's a little more ambiguous. And that was the thing: I never wanted to make a full-on horror. It is a ghost story, but it's a ghost story in an older tradition. If you look back at The Turning of the Screw by [Henry] James, if you look at Dickens' ghost stories, there's an attempt to use the form to tell you something about people or the culture where it's from. What I'd found so compelling about what Sarah did with the novel is she'd used this ghost story idea, this poltergeist idea, to talk about the sorts of things that are in people that they desperately try to suppress and the effect that has on one's life. If there are destructive things or longings or regrets or needs unfulfilled that you suppress, then they will come out and somehow to spite you. They will wreck the rest of your life. Obviously, there's a question of whether or not there is actually a haunting going on. Did you come down on the side of whether there is a ghost? Abrahamson: Yes. And I actually think it's important to do that. In the making of it, I at least need to have a reality that I'm describing. And so for me, yes, there is. There is a ghost. Or there is a thing in the house. As Will Poulter says in the character of Roddy: "There is a thing in this house that hates us." I think whether it hates them is a question you could ask, but I think there is a thing in the house. Now, I don't believe in any such things in reality. But in the story world of this film, I think it's really important there is some truth to it. For quite a long part of the film, you can go, "Well, I don't know. Maybe Faraday is right. Maybe it's all in people's heads and it's overactive imaginations and stuff." But actually, I think there's a part of the film where you just go, "OK. There's no other explanation." But it's what that thing is, where it comes from, and what it means that's ambiguous in the film. Abrahamson: You go back to that tradition of the Jekyll and Hyde story. And where Mr. Hyde the monster is all the bad bits of the person, of the Dr. Jekyll. What happens in this film, poor Dr. Jekyll knows that this monster exists, but I think what's so moving about The Little Stranger is that Faraday -- the kind of human Faraday is, the person so desperately longing for love and acceptance but who doesn't know how to get it -- he is unaware of the Mr. Hyde. It's some kind of version of his childish rage and longing. In the book, the last line is Faraday looking at himself in a cracked window pane. Here, the last shot is the boy version of Faraday. Why did you choose to do that? Abrahamson: Obviously, the ending of the film is something that we put an awful lot of thought into and experimenting and debate and nuancing in the editing. The audience's focus puts tremendous pressure on the end of a film like this because it's where you expect the reveal to be. Leaving aside its meaning and who is doing what to whom, the emotional experience of seeing this little boy left alone in the house is really important for me. The child, who always somehow desperately wanted the life he was excluded from, in the big house. He's a clever, sensitive little boy who's ambitious, whose mother adored this place so [she] probably filled him with stories about how amazing the family and the house were. And so his whole life had warped his desire to be accepted by people who won't accept him. The point the film makes is, OK, if you act on those sorts of unresolved impulses, you may technically get what you want, but what you get will be empty. The boy does get the house, but what he gets is bricks and mortar and emptiness. None of the glamour, none of the warmth, none of the love and excitement that he imagined as a child. What about the other aspect: Who is doing what? Abrahamson: I suppose what that image of the boy at the end is saying is that the force in the house is something that came from the child. There's a scene earlier on with the other doctor in the pub. Faraday and he are discussing whether or not, under significant pressure, the subconscious might somehow fracture from the conscious and become a force by itself. At the moment where the boy breaks the acorn, that's the moment at which his rage, desire, impotent longing, and knowledge that he'll never be accepted [fractured]. That's where that happens and that's where you feel the house has absorbed something. And that's what lives in it. And the image of the boy is a kind of representation of that. We're not saying that it was the physical boy [that pushed Caroline]. We're saying that it was something of him. Abrahamson: Did he just go in? Did he push her? Do you have thoughts on that? Abrahamson: [Faraday] says he sees something distorted in [Caroline's] eyes. So we imagined it as a kind of monstrous or deformed version of Faraday. That's how it manifested itself to her. Put it like this: How does this thing in the house show itself to all the characters? So to Roddy, who obviously was in a fireball of a plane crash, it shows itself as fire. To Mrs. Ayres, it shows itself as the lost girl, the daughter, Sukey, who is also the misdirect. But to Caroline, it's the monstrous version of him, which is the closest to the truth. And at the end, we just show the boy. So you didn't want it to seem like Faraday actually committed a murder? Abrahamson: I have had people who have seen previews go: "I think maybe he just went back in." And that's OK. I'm not in charge of that. I have my view of it and certainly it's a privileged view because I get to make the film. But at the same, I don't want to ram that down anybody's throat. And there is a way in which it is really Faraday. And the Faraday that leaves the house, and the Faraday that is up on the nursery floor, they are never to be united. The book moved me because Faraday's character -- even though he is terribly repressed and sometimes sort of jarring or that lovely word "rebarbative" -- is just like all of us, somebody who started out wanting to be loved and to love. That class system is the warping dimension. This is a film set in Britain in the mid-'40s which is about class, but actually any ideology or social kind of structure, which diminishes one group of people and elevates another, is ultimately profoundly destructive at a personal level to both sides of that. Domhnall's performance is remarkable. What conversations did you have? It's hard to perceive when it shifts, but as the movie goes on, he turns Faraday into someone insidious and misogynistic. Abrahamson: Domhnall is the sort of actor -- and it's not always the case -- who can step out of the immediate kind of experiential aspect of acting and he can talk about what the film is. Not just about his character, but about the global story. We talked about the idea of Faraday as, you know, there's that famous Spaghetti Western where the character is carrying nitroglycerin. He's carrying this explosive liquid and therefore he has to be really careful with everything he does in case it explodes. That was one image we used quite a lot: Domhnall is so contained and careful and repressed and buttoned up. Not because he's cold, but precisely because he's somehow subconsciously aware he has this terrible force in him. When he is angry, stuff starts to happen in the house. There's this symbiosis between him and "the thing." What's quite interesting was in the making [of the film], we sometimes pushed it much further and we would show more of this anger in him. It felt to me -- and working with Nathan Nugent, this editor that I love -- that the film lived better the more delicate you are with those elements. Because you need to stay with him as a character for as long as possible. Did you think about the happenings in the house in a similar way? Abrahamson: The thing about the book is, because you are listening to the story through Faraday's narration, you're seeing what the fire is like because Rod tells Faraday. It means you can sit with the book and go, maybe it wasn't like that at all. So the delicate and difficult thing in the film is, if you're going to show it, and you show it full tilt as Rod describes it, then all questions are answered. It's always point of view that's the hardest thing to deal with in going from literature to film. The presumption of objectivity in film -- namely, you turn on the camera and there it is -- means you've got to work hard to hide in a different way. What was funny was showing Domhnall the film. He's amazing in the film, but there's loads of material where he was allowed off the leash, you know? We were very sparing with our use of that in the end. Did you have any pressures from the studio or anyone else about making it more of a horror? Abrahamson: I think there probably were voices saying that, but never disrespectfully or aggressively. Because I think it would be an easier film to market. Everybody knows how to market that film. But we didn't shoot it like that, and the story is not like that. And I said from the very beginning, "You know guys, I'm not making a genre film." I'm usually the one going, "Are you sure you want to fund this film? Because this is what I want to do. Are you aware of the sorts of films that I make? This is not Downton Abbey with scares. It's something else." I think the important thing in getting it to audiences is just to say to them: Don't go in looking for jump scares or horror moments. If you go in with that in mind, I think what the film does is more interesting.